As you've probably noticed by now I've done a little re-branding. I thought I would start the new year with a fresh start and make this place more of a creative space and place to share my art and inspirations.This whole re-branding thing is for the birds. I forgot how much work it is to start from scratch! What was I thinking? After a lot of hours planning and obsessing its finally all here. I created this little mood board to give you a little visual of everything new to the site and shops. I wanted everything to be very clean and bright, so I opted for colors that I've used in the past with this space. My two inspiration photos, the pretty paper confetti colored envelopes, and polka dot paper really gave me the visuals I needed to start designing. I really love the look and how everything turned out. I also love the way watercolors I painted were incorporated into the design as well, adding a little texture and personality. All in all re-branding was worth it. I know that i've changed this space a lot in the recent past, I've dissapeared, talked about walking away from blogging, and even played with the notion of starting a new blog all together but I just cant seem to walk away. I love you all to much, and over the years I have put so much of my heart and time into this place and I just cant leave it for dead. I am coming back with a vengence. Things will be different here, I want this space to change as I do, no matter how frequently that is. I've been working so much more on my painting, pouring my heart into designing paper goods products and prints and I want to share that here but in a more organic way. I've also been focusing a lot on knitwear and even working with modern calligraphy. This space originally started as a vintage lifestyle blog but I've moved so much away from that and while I still love vintage and mid century modern design it just doesn't make since for me to make that the focus here anymore. I need to broaden my horizons and make this more of a creative journal. I hope that you enjoy this new place, new design, and new name just as much as I do and that the things I post here inspire you. I've updated most of my pages, and I'm working on putting up a portfolio soon with little previews of my custom work and some prints. My Etsy, Storenvy, and Society6 are also looking so fresh and so clean so head on over and check them out. Currently I only have on print available but I will be adding more soon! I've also created a Instagram account and Facebook page, so if you would like to know the latest and greatest feel free to follow along there! I love the textures. ♥ It all looks very beautiful. 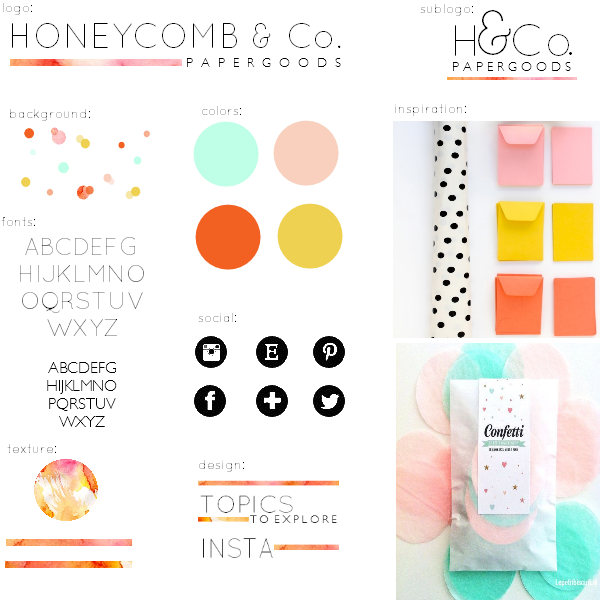 The name Honeycomb & Co is lovely too. Great work and all the best. Thanks Abi! I was ready for a change! I dig the new look. Sometimes we just need a (somewhat) fresh start to get back on track! Exactly Jennifer! Change is refreshing! Thank you Kyla! Your blog is one of my favorites! It looks great! Everything looks great. I love the colors. You're wonderful Sunae! Thank you for supporting my little business! Oh goodness, I LOVE the new look. Seriously! Thank you Angie! I'm glad you like it!